As I noted recently, Jim Bohnhoff was working on a sign for The Sketchy Artist (located at 300 Division Street). As you can see in the picture, the sign is installed and, if all goes as planned, the store opens today (Thursday, January 17th). I have long been a big fan of Jim’s sculptural signs. His signs have helped give a distinctive look to our unique shopping district. However, I hadn’t been keeping count. 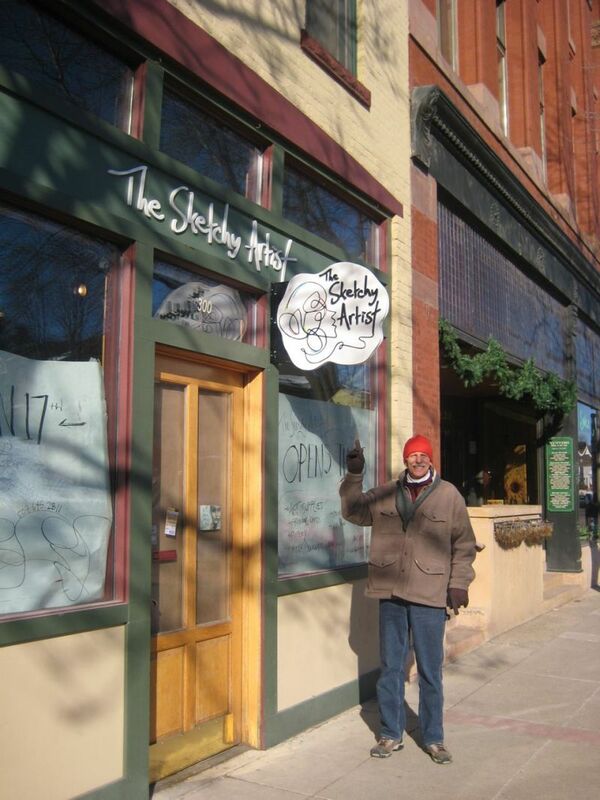 In an e-mail that I received from Jim the other day, he mentioned that the Sketchy Artist sign is the 34th that he has installed in Downtown Northfield over the past 30 years. In fact, his resume includes The Rare Pair, Forget-Me-Not Florist, Kids on Division, Goodbye Blue Monday, the Northfield News, River City Books, Anna’s Closet, Fine Groove Records, Just Food Co-op, Hogan Brothers Acoustic Cafe, The Contented Cow, Monkey See, Monkey Read, Sisters Ugly, and Biermans Home Furniture. It’s an impressive list of not only way cool signs but way cool businesses. So come on down(town) and check out Jim’s latest sign and say hello to April Ripka, the owner of The Sketchy Artist. yea! i’m the 34th. and jim did an AWESOME job!! the lettering, the weird shape, the mounting…goodness knows i didn’t give him an easy task. but the sign says it all! thanks so much jim! !